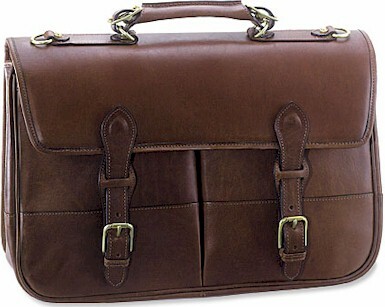 This classic saddle bag is a wide gusset flap over briefcase. Hand crafted from vegetable tanned saddle leather and accented with solid brass hardware. It features an Easy Access organizer, dual front pockets, adjustable handle, durable balistic lining, inside zippered pocket, open back pocket, keychain holder, and an adjustable shoulder strap. Available in brown only. On the Outside, the two buckle closure secures the case. >>> Jack Georges has a new promotion starting ..